Westerlund 1 is a beautiful cluster that comprises one of largest stars in the Milky Way. This red supergiant Westerlund 1-26 is so huge that if were in the center of our Solar System, it would cover all four rocky planets and extend beyond the orbit of Jupiter. Hubble telescope just got very wonderful view, when zoomed in. The cluster is located in the Ara constellation. Bengt Westerlund was the astronomer, who first spotted the “heavily reddened cluster” in the Southern Hemisphere sky in 1961. Westerlund 1 lies only about 15,000 light-years away from us, which is quite close in astronomical terms. The stars in the cluster are so rare, we only know of about a dozen across our entire Milky Way. Most of the stars in the cluster have similar ages and compositions as it is believed that the cluster formed in one large burst of stellar activity. The beautiful collection of stars is among the most massive star clusters in our galaxy, and comprises many extremely glowing objects. The cluster is only a few million years old. For comparison, our Sun is almost 4.6 billion years old. Westerlund 1 contains six yellow hypergiants, four red supergiant and 24 particularly rare objects called Wolf-Rayet stars, which can be up to a million times brighter than the Sun. 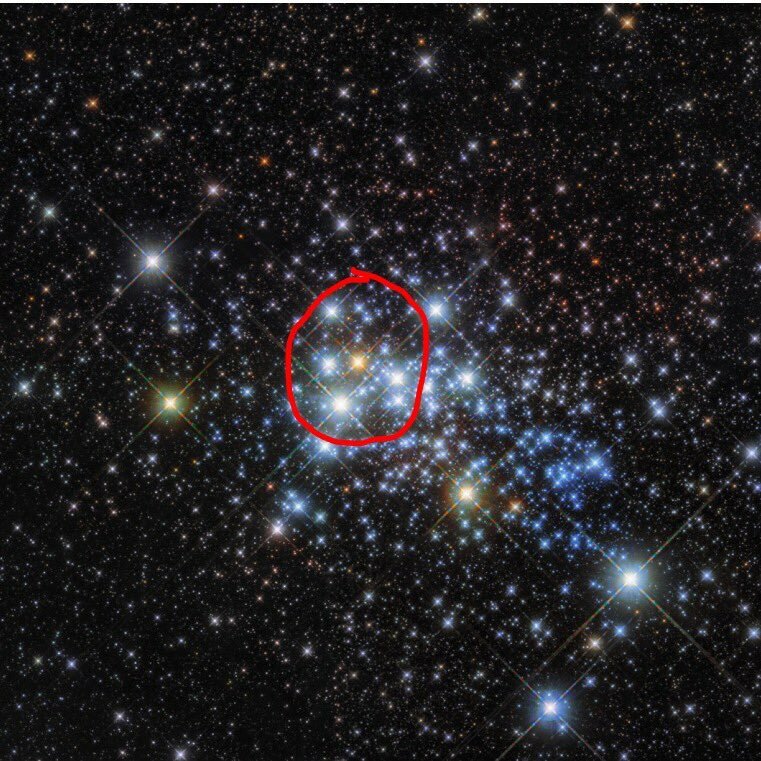 But the most special thing about Westerlund 1 is that it contains a luminous blue variable, an extremely rare type of star having some unpredictable changes in its brightness with time. Hubble's Wide Field Camera 3 captured the latest images with both visible and infrared data. It’s obvious that brighter doesn't necessarily mean bigger, which makes it tricky to figure out which of the bright dots is W26. According to astronomer Alan Duffy from Swinburne University, it's most likely the bright orange star. W26 has a radius of about 1,530 solar radiuses (star size is measured against our own Sun, naturally). The red supergiant is thought to be so big, it easily sits within the top 5 of the biggest stars we've ever found. UY Scuti, also a red supergiant found in the Scutum constellation - it's 1,708 Solar radiuses wide. Lifespan of massive stars is shorter, as the stars in Westerlund 1 are so massive. In 2013, astronomers announced that W26 is already nearing the end of its life. UK's Royal Astronomical Society states: "Stars with masses tens of times larger than that of the Sun live very short and dramatic lives compared to their less massive siblings, some of the most massive stars have lifetimes of less than a few million years before they exhaust their nuclear fuel and explode as supernovae."